From time to time we come across a product that makes us scratch our heads. Talk about things that make you go hmmmm. 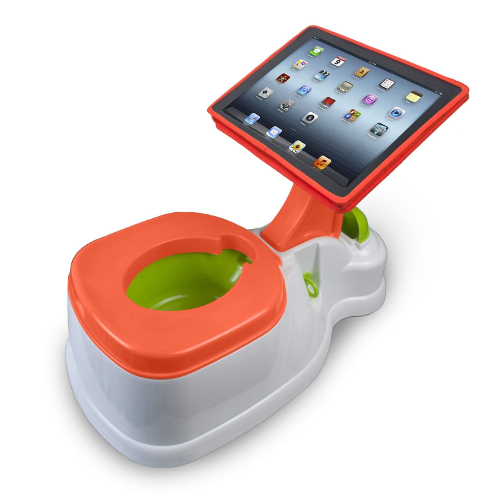 Well here we have the iPotty, a potty seat for your toddler and your shiny iPad. We can understand the frustration of trying to potty seat your child and them just running around the bathroom or house in their birthday suit eventually marking their spot wherever they want. This is where we imagine the iPotty comes in. Children are pretty much always amazed at the games and displays on almost any electronic device. The iPotty takes advantage of this weekness and preys on the inocent toddler luring him or her in to the ultimate throne for tiny ones. You can pick up your iPotty on Amazon but we urge you to make sure you wash your hands when you are done.